Prove to an Argonian master you are worthy of further training. Tooth-in-the-Sea heads into Niben Bay for some quiet contemplation. Once you have an Alteration skill of 70, speak with Abhuki at Faregyl Inn or Athragar at the Chorrol Mages Guild to learn who can train you further. When you have acquired the recommendation, speak with Tooth-in-the-Sea for master training in Alteration. Prove yourself worthy of master training by surviving three hours underwater. Once you have leveled up your Alteration skill to 70, head to Faregyl Inn, located northwest of the Inn of Ill Omen, or to the Chorrol Mages Guild and ask either the Khajiit publican Abhuki or the Bosmer spell merchant Athragar about further training in Alteration. They will tell you that the only one that can train you further is Tooth-in-the-Sea, an Argonian who enjoys swimming in the waters of Niben Bay. 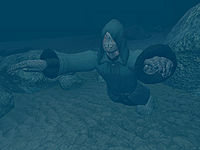 Tooth-in-the-Sea can be found north of the city of Bravil on the coast of Niben Bay; his encampment is slightly east of the Flooded Mine. He will only give you his challenge before 1pm and while he is swimming in the bay; otherwise he will tell you to wait until he has found his favorite spot. Once you have spoken with him, he will let you know how you can prove you are worthy of his training. Create a custom Water Breathing spell or purchase one from Trayvond the Redguard at the Cheydinhal Mages Guild, Ungarion at A Warlock's Luck in Bravil or Edgar Vautrine at Edgar's Discount Spells in the Market District of the Imperial City. If you have done the Cheydinhal Recommendation quest for the Mages Guild, you will have been given the Buoyancy spell which will do the job. Create a custom potion with alchemical ingredients. Note that without a master level in Alchemy, you will need at least two ingredients with Water Breathing as a common effect to create a potion. Wear an item with a permanent Water Breathing effect. Three such items that can be easily obtained are Fin Gleam, the Jewel of the Rumare, and Nistor's Boots. If you are an Argonian like Tooth-in-the-Sea, he will tell you that you do not need to do the test. Once three hours have passed, Tooth-in-the-Sea will approach you and agree to train you further in Alteration. Like Torbern, Alawen, and Bralsa Andaren, if Tooth-in-the-Sea dies before beginning his Master Training quest, the quest can be obtained but not completed, and will stay active in your journal. 10 To learn more about Alteration, I must find Tooth-in-the-Sea, who lives north of Bravil, near Niben Bay. 20 Tooth-in-the-Sea has told me I must prove myself; I need to meet him out in Niben Bay during the day. 30 I must remain with Tooth-in-the-Sea for three consecutive hours if I am to prove myself worthy of his training. 100 Finishes quest Tooth-in-the-Sea has agreed to teach me what he knows about Alteration magic. 200 Finishes quest Tooth-in-the-Sea is dead, making it impossible to further my training in the skill of Alteration. It is possible to use the console to advance through the quest by entering setstage TrainingAlteration stage, where stage is the number of the stage you wish to complete. It is not possible to un-complete (i.e. go back) quest stages. See SetStage for more information. Esta página foi modificada pela última vez à(s) 06h04min de 25 de janeiro de 2014.